office@alfretontc.co.uk or call 01773 520032. 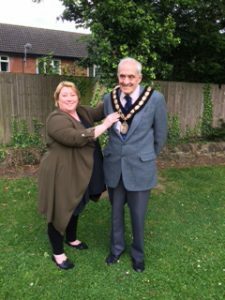 Councillor Mary Kerry can be seen passing the Chain of Office to Councillor John Walker. Leisure Centre gifts equipment to Town Council. The Town Council was approached at the end of 2016 as potential recipients of a defibrillator from fund raising at Alfreton Leisure Centre. The equipment, which is there for anyone to use on someone in cardiac arrest, has been installed in the grounds of Alfreton House, and is easily identifiable by the bright yellow box. Fitting a defibrillator and housing unit costs around £1,500, the installation costs have been met by the Town Council and ongoing maintenance and checks of the unit will be the responsibility of the Town Council. Shown with the Town Mayor, Councillor John Walker are Michael Conway who a made significant personal contribution to its purchase, due to having first-hand experience of requiring a defibrillator whilst having a cardiac arrest at Alfreton Leisure Centre and Manager Peter Sharkey. 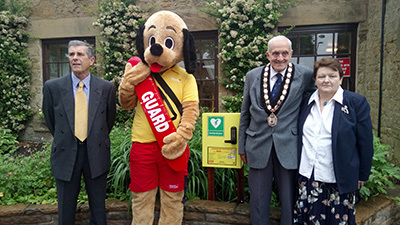 Hector the Hound is the Leisure Centre’s mascot and he stole the opportunity to grab the attention of children, so they too become aware of what a defibrillator is and how it can be used to save lives. 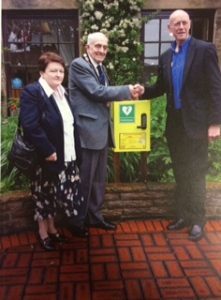 Town Mayor, Councillor John Walker said ‘The Council welcome the gift from the Leisure Centre and were happy to support their suggestion of installing the defibrillator at the opposite end of Town to them. This is a vital piece of equipment which, you would hope is never required but when needed has the proven potential of saving lives. It will benefit the residents and visitors to Alfreton’. In an emergency, people phone 999 and the ambulance service will give them the access code to open the box housing the defibrillator. An ambulance is then dispatched and the operator provides guidance on what to do. This is all clearly explained on the front of the box. The staff and members of Alfreton Town Council have a training session in early July on the correct use of the equipment and maintenance checks.